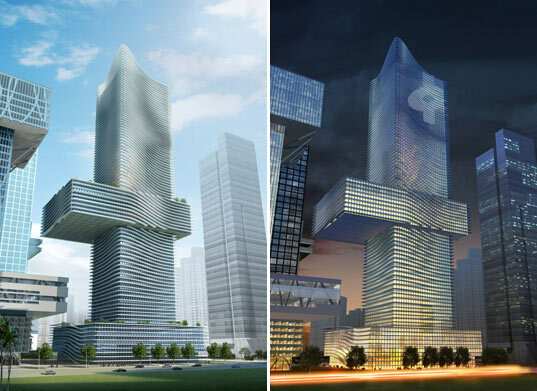 Green building of the week from Inhabitat is this tower planned for China Insurance Group - A Shining Solar Skyscraper for Shenzen. Austrian architecture firm Coop Himmelb(l)au recently won first prize in a competition to design a shimmering skyscraper that will house the new headquarters of the China Insurance Group. The 49 story tower will rise over the central business district of Shenzhen, a thriving economic center on China’s southern shore. The flowing outer skin of the building will be lined with photovoltaic cells and will feature mechanisms to increase wind resistance, shade the interiors from sunlight, provide natural ventilation, and display multimedia banners. ... The passively designed outer skin of the structure will help regulate inside climate and be powered in part by solar and wind energy.